This might seem like a bit of a strange tip for going plastic free but, the thing is, being plastic free whilst on the go usually means being prepared and carrying some extra bits and pieces with you. I have used a backpack for sometime now, mainly because I get mad shoulder pains if don’t, so for me this hasn’t really been an adjustment, instead I found that I already had the perfect place to keep all the bits and pieces I needed to be plastic free. Fortunately too, backpacks actually seem to be fashionable right now, which is great because it means there is loads more choice and it would be hard not to find one you love. From experience, a lot of people, women in particular, will likely still prefer a shoulder bag. If that sounds like you, then you can still keep to hand some of the smaller items listed below, or why not opt for an oversize shoulder bag instead? Seriously though, try out a backpack! So save yourself a lot of money, and save the world a whole lot of plastic, by buying yourself a reusable water bottle. And say hello to a lifetime of free (OK so I know we pay for household, but the cafes don’t charge), tasty, clean, fresh and home grown tap water refills. Just walk on in, with your bottle proudly in hand, and try not to look too smug when the person buying the water looks down in dismay as they realise their mistake. I mean that too, tell them where to buy one, tell them how good they are and help spread the word. There are plenty to choose from but personally I have been using a bottle by Chilly’s. It is stainless steel, which I prefer to BPA free plastic, and I have zero complaints. They are a decent size to be able to pop into your bag, they don’t leak and you get no metallic taste either. The only thing you have to get used to is that the mouth of bottle is bigger than most you would buy, which means it’s not quite as easy to drink from if you are, say, walking at pace. The other great bonus is that they keep cold liquids cold for 24 hours and anything hot (you could use it for soups or mulled wine when the season arrives!) stays hot for 12 hours…awesome! Since the 5p bag charge, many more of us have taken to keeping reusable bags for the supermarket shop. This is great, and the number of plastic bags being used is reported to have gone down by 85%, which is massive! A great move that has had a huge impact. But what about those little unplanned trips to the shop, the unplanned clothes shopping trip or the cute little market that you randomly stumble across? It happens to all of us, and unless you want to play a game of shopping jenga on the way home (believe me I have done this in the past!) you will likely end up saying yes to that 5p charge. Instead, carry a bag or two with you on the go so that when asked “Do you need a bag with that?” you can proudly wield your beautiful reusable bag and feel that bit better for doing so! They come in so many designs, weigh hardly anything and the lightweight fabric ones are easy to fold up small in your bag. Just make sure to use them so you don’t end up with a giant pile of canvas bags that you keep forgetting to use! My only other advice is to try and avoid the reusable plastic bags, they are still plastic at the end of the day and aren’t designed to last as long as the fabric, jute and canvas ones. They will also take way longer to break down as they’re designed to be sturdier than the single-use ones. In all honesty, if you decide to cut down on plastic, especially single use plastic, then you will probably find that your need for cutlery on the go is reduced anyway. Being that most of the pasta and salad pots that drive the need for disposable cutlery are made of plastic themselves, hopefully you have already taken to avoiding them when at all possible. There is still the odd occasion though where the need for cutlery wins out, especially if your a sucker for some market food! Unless there is a biodegradable option available, you either use plastic, or do as my brother once did and end up with half of your lunch on your fingers (apparently my plastic talk has got to him!). As much as it was pretty amusing to watch my brother make a real mess of his lunch, he really could have done with a fork. So now I am on a mission to get myself some bamboo cutlery for just this occasion. There are various options out there, some come with pouches, some without. You can opt for a full cutlery set or just a spork, even those come in different varieties! Personally I have been using a metal fork from my usual set at home whilst I wait for an order to arrive from GreenTulip. Once I get a chance to use them I will let you know how they are. 1 Billion throwaway straws are used every day across the globe. It is an obscene but perfect example of our throwaway plastic society. So my solution to this is to buy yourself a reusable one! This is actually one of my favourite plastic fighting solutions because more often than not it becomes quite the talking point. It is quite a statement when you go out of the way to ask for no straw, and follow it up by confidently dropping your own into your drink instead. I don’t mean you should be cocky about it, but you should feel good about it. 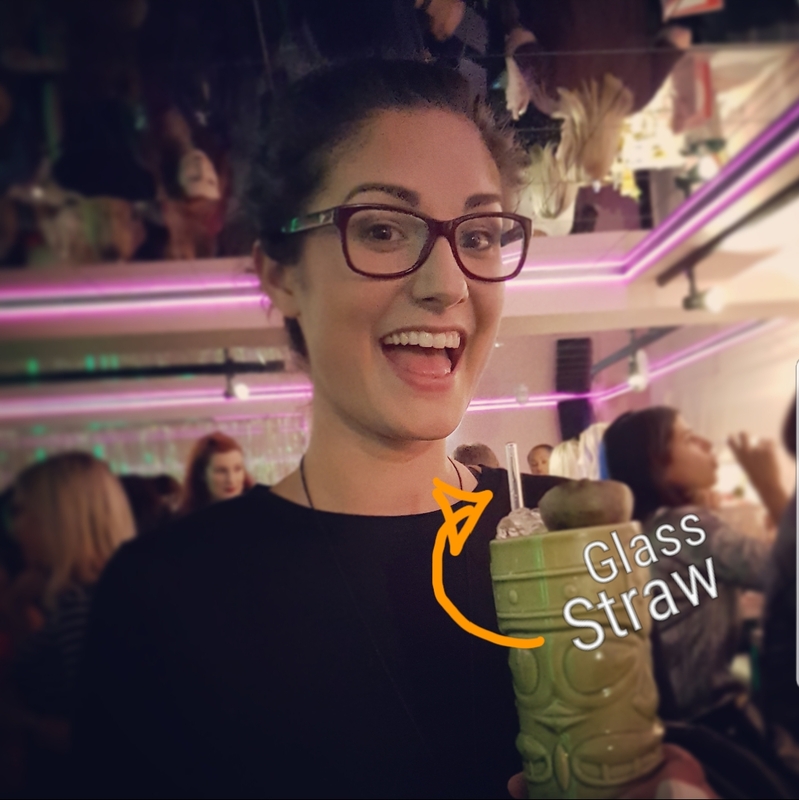 Every single time I see the bar tender look at the straw a little confused, or even get a quizzical look from a friend, I think, yes…this is a statement. It might only be a small one, but it is a statement nonetheless. It says you are trying to be better, trying to look after the planet and that you don’t mind who knows it either. It almost always invites someone around you to ask about it, which in turn means you get a chance to tell people about it too. It is such a simple thing to carry, I even carry around four of these, two short and two long, so that I am prepared for whatever drink I fancy and so that I have enough to get my friends involved too. 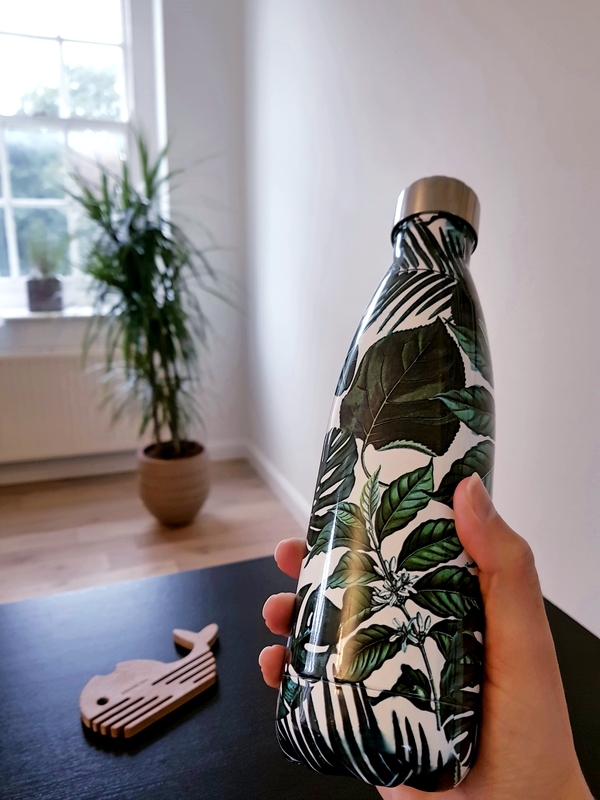 Personally I use glass most often as they are really strong, easy to clean and I like the look of them the most, but I do have a bamboo one that is incredibly light and easy to pop in my pocket, which came free with the pouch I bought to keep my straw safe. 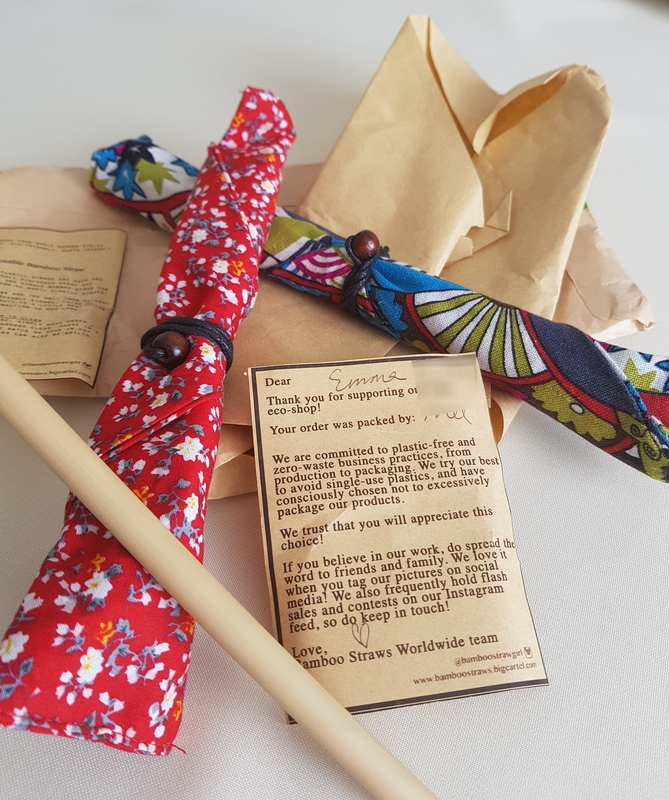 They have a selection of bamboo cutlery too but they come from the U.S., so bear the shipping in mind (I didn’t factor this in when I first got excited and started my plastic free adventure). You can buy them from all sorts of places but I bought mine from EcoStraws in the UK as I was happy to read that their packaging choices back up their eco-minded products. They also sell a hemp sleeve to keep them from getting scratched!